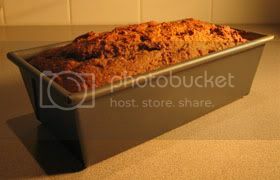 Loaf is a term used to describe any shaped mass of food, as in veal loaf or the more generic meat loaf, although it is usually reserved for items of bread. It has evolved to include sweetened doughs with a less elastic texture and a smaller crumb, e.g. cake. The loaves (or squares) you see here cannot rightfully be called bread, nor are they cake. They were developed to make use of more healthful ingredients, to lessen the gratuitous use of nutrient-poor fats and sweeteners, and to maintain an attraction to the Fanatic's Resident Eater (FRE) that would preclude him visiting vending machines for Tastykakes©. The methods and pictures you see in this recipe (as in all recipes) reflect the actual raw materials and technique used to produce the final product as displayed. I purchased the squash pictured with the intention of baking a Sweet Potato Squash Loaf. But it cooked up more dry and mealy that previous ones I'd used to develop this recipe ... not at all recipe-ready, but salvageable. Here is my experience with my less-than-squishy squash. 1 Preheat oven to 320°F. 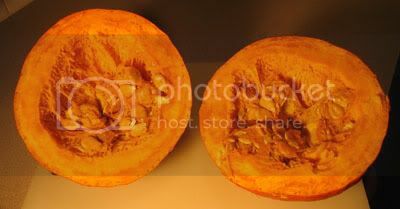 2 Remove label from squash. Clean exterior with plain water to remove any dried mud, bits of leaf/vine, and desicated insects. 3 Place whole squash on a baking sheet. Cook for approximately 1 to 2 hours, turning every 20 minutes to ensure even heat distribution. Note: The total cooking time will depend on the size and quality of your squash. Remove from the oven when it softens and gives easily when pressed. Many recipes, even the instructions included with this squash, recommend puncturing with a fork prior to baking. Punctures act as vents, allowing moisture to escape as the temperature inside the gourd rises. This puncture precaution, no doubt, is to avoid the off-chance of an ungodly mess should the squash explode in your oven. You'll note the absence of this instruction in my methods. I have found that the worst a hot squash is capable of, at the temperature given, is a split. The baking sheet can contain any material that oozes from this opening. I don't recommend venting the squash because the moisture that builds inside assists in steaming the flesh, and produces a softer, moister, more recipe-ready product. 4 Remove squash from oven, tent with a kitchen towel, and allow to cool slowly. When cool, slice in half and spoon out the seeds. Scoop the (hopefully) softened flesh into a container to be used as an ingredient in your loaf. May be kept refrigerated for several days. Note: A vegetable of this size that houses several cups of possibly boiling pulp will require a number of hours to cool. After cooking, the flesh of my sweet potato squash was disappointingly dry and potato-like. In this condition, it's not suitable for use in this recipe. But sometimes you can deal with nature's surprises. Step 5 need only be followed if you encounter a dry squash. 5 After discarding the seeds, slice off rind and cut squash into chunks. Mash any softened chunks with a sturdy fork, potato masher, or pastry cutter. 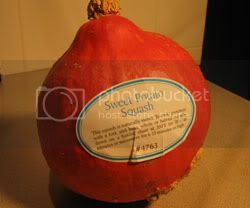 Place squash chunks into an oven-safe pot with a tight-fitting lid. (Aluminum foil can substitute for a lid.) 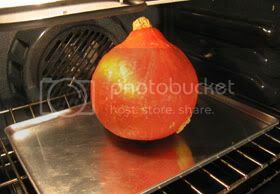 Add about ½ cup water to the squash and bake/steam in a 300° F. oven for 1 to 2 hours. Stir and mash contents briefly every 30 minutes and add more water if the bottom of the pot dries. Bake until the squash resembles lumpy moist mashed potatoes. Note: This steaming process will cause the squash to absorb moisture and soften. In my particular case, I baked the squash originally for two hours, and steamed the squash flesh for an additional 2 hours, adding almost 1 cup of water. If you aren't inclined to pay homage to a squash, there's always canned pumpkin. 1 ¾ cup whole wheat pastry flour, less 4 tbsp. 2 Rub oil on the insides of an 8 by 4 inch loaf pan. Dust with flour. Note: A 9 by 5 inch loaf pan may be used, but the loaf will not rise as high and will be denser. 3 Measure 1 cup of your baked/steamed squash. Pack the cup so no or few air pockets remain. Combine the mashed squash with honey, molasses, oil, yogurt, and vanilla. Whisk or beat vigorously. 4 Whisk the two eggs separately from the squash batter. Note: Egg proteins coagulate or curdle in the presence of acids. The liquid ingredients in this recipe are acidic enough to cause coagulation. This can be reduced if eggs are added right before baking. 5 Stir together pastry flour, wheat germ, wheat bran, baking powder, baking soda, salt, cinnamon, ginger, nutmeg, and cloves. Unless your flour uses the word "pastry" or "soft", it is probably made from a hard or winter wheat that contains a little more protein. This extra protein will absorb more water and produce more gluten, resulting in a denser, less voluminous product than if you used pastry flour. 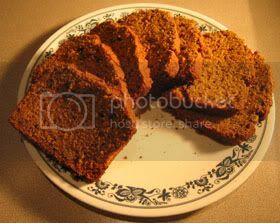 Of course, if regular whole wheat flour is all you have on hand, don't let it stop you from trying this recipe. It will still be delicious! 7 Add about 2 tbsp. of the liquid batter to the whisked eggs and beat. Slowly pour the beaten eggs into the liquid ingredients, whisking the batter as you pour. 8 Add dry ingredients to wet. Stir until just combined and no or very few dry lumps remain. Gently stir in chopped nuts. Pour into prepared loaf pan. Bake at 350°F. for 45 minutes to 1 hour. Loaf is done when a toothpick inserted into the middle comes out clean. 9 Cool thoroughly in pan before removing. Note: Many recipes recommend depanning shortly after removing from the oven. This is done to prevent the loaf from becoming soggy. I have found that delicate batters such as cakes and white-flour-based quick breads are more prone to this.